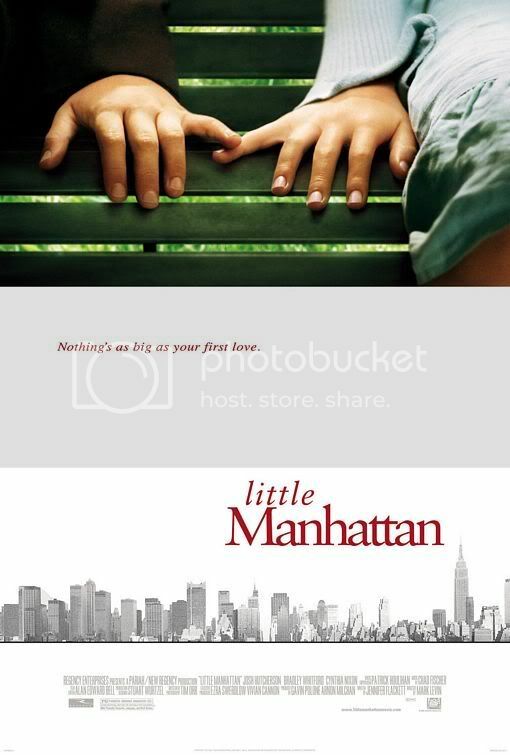 Little Manhattan is primarily a standard romantic comedy, but with protagonists a good ten years younger than normal. Some of it is standard, some is obvious and forced, some is sweet, but the primary message is strong enough that I am wont to forget the film’s many flaws. Young Gabe (Josh Hutcherson) is ten, nearly eleven. To him, girls are icky; they’ve been known to cause cooties since his days of kindergarten. One of the opening scenes has enough projectile vomiting (caused by being touched by a girl, spreading like a zombie virus) to nearly rival Stand By Me. Gabe has a happy life, generally. He trains to be a placekicker with his dad, Adam (Bradley Whitford). He has fun with school chums playing basketball. The only downside is that his parents are in the middle of a divorce, made messier by New York’s divorce laws. The couple can’t leave their apartment until the divorce is final, meaning that Adam has been sleeping on the couch for a year and a half. Making the situation even more awkward, Gabe’s mom, Leslie (Cynthia Nixon), is dating a new man. But Gabe is generally quite pleased with his life. Until, that is, he spots a girl. He’s known her since kindergarten, and they were playmates before the “iron curtain” of school forever segregated the sexes. But how long does “forever” last? After the girl, Rosemary (Charlie Ray), joins his karate class he starts to develop different, confusing feelings. Does he like her? Does she like him? Why can’t his heart stop freaking out? Their budding relationship blossoms as summer continues. They practice karate together, go out in Central Park, and try to spend as much time together as possible. But there’s a hitch: she’s going off to summer camp in two and a half weeks. What can possibly happen in that small amount of time? Gabe is convinced that all love eventually comes to an end. His parents, after all, are splitting up; surely nothing can last forever? The movie has its share of the independent/quirky bug. There are some whimsical and cute moments, none of them too overbearing. Cute animations pop up unexpectedly, adding a little character to an otherwise standard concept. The movie has a love of New York, to an extent that the city is nearly a character, though not as developed as in films like Taxi Driver. The soundtrack, too, is semi-independent, though more geared toward children than something like Juno [review here]. There are a number of problems with Little Manhattan, however. Some of it lies with the young actors, as directed by Mark Levin (directing Jennifer Flackett’s script, who happens to be his wife). Hutcherson is cute, but sometimes is rather forced and obvious. There are occasional timing issues with his delivery, and he comes off as a bit stiff. It doesn’t help that the framing of many shots, particularly toward the beginning, is in the awkward range between too much headroom and too little. To cap it off, the majority of the film is narrated by Gabe, taking away from the effectiveness of the acting. At times it’s almost like a silent film, told with intertitles of voiceover. But the reason I’m willing to forgive many of these flaws lies with how the film deals with divorce. It is evident that his parents’ split will be effecting Gabe’s view of life and love as he grows older. Eventually his father has a talk with him and Gabe asks about women, who seem un-understandable. Adam starts talking about how their marriage got off track; how little things were left unsaid and these piled up until they were overwhelming. Gabe, attempting to learn this important lesson, theorizes that he better start saying the unsaid things early in life. In a minor spoiler, Adam starts to understand his own words, and, though everything is not neatly wrapped up, there is a satisfying conclusion. It is very fulfilling to see a film where the adults are willing to work at a marriage to prevent its failure. It’s a shame that Little Manhattan isn’t a better film. There are some great themes that are explored maturely and thoughtfully, but it is too bad that the majority of the movie is obvious and overly narrated. Some kids might enjoy the film and some adults will be able to look more deeply at some of the important themes, but there are some major flaws that prevent a recommendation to a wide audience. This is a film I wish I could rate more highly, as I truly appreciate some of its themes, but it would be dishonest not to judge the film as objectively as possible. This entry was posted in 1.5 pirate flags, 2.5 stars, L, Movie Reviews, Pirate Flag Rating, Star Rating on May 26, 2010 by Tim Irwin. its nt to cap it off….didnt u get the sense of humor of tht 10 year old guy?? its for entertainment not a guide on “how to cope with divorce” !